During the presentation portion of the CPC on Saturday & Sunday Barbara’s topics will include Addressing Screaming for Attention (Sat) and her hands on work with Sirocco the Kakapo in New Zealand (Sun). Are you struggling with parrot behavior problems? Are you wondering how to train your parrot to be more fun and interactive? Or do you just want to find ways to create the best life possible for your feathered companion? Then join us for an informative day of Force Free Animal Training (FFAT). 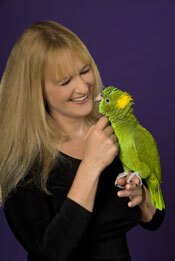 FFAT is the term Barbara Heidenreich uses to describe her style of animal training. Force free means the use of coercion and aversives to get desired behavior are not an option. Instead Barbara focuses on using positive reinforcement, empowering animals to choose to participate and building a relationship based on trust. This results in a well behaved, interactive and entertaining companion parrot. We will explore FFAT via lecture, video, games, activities and live training demonstrations. You can expect an informative, inspiring and fun day of learning. Barbara Heidenreich travels the world training the earth’s most unusual creatures. This in-demand trainer has worked with everything from rabbits to rhinos. Barbara has a degree in zoology and is an adjunct instructor at Texas A & M University. She has produced seven instructional DVDs, authored two books and has been published in nine different languages. She is famous for her enthusiastic and entertaining presentations, but her true gift is her kind and gentle approach to animal training. She helps people solve pet behavior problems, demystify animal behavior, and connect with the animals in their lives.